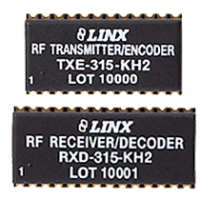 Linx Technologies RF Modules and antennas are the only RF components you need to add wireless features to your product. The modules are already tested, so you don’t need to spend time tuning discrete components or setting registers which saves you the hassle and expense of engineering RF functionality from scratch. Transparent modules are a wireless wire. The data that is input to the module is used to directly modulate the carrier. 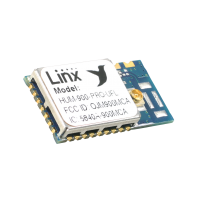 There is no wireless protocol built into the module, no buffering or storage of the data. Usually there are no processors of any kind in these modules, just the physical radio. The advantage of these is that the designer has complete control of the over-the-air data. A wireless protocol can be created that is most efficient for the system; scaled for the amount of data sent by the product, the capabilities of the processor in the product, or both. A company can create a protocol that defines a new market. The products are open, so they can be very dynamic. 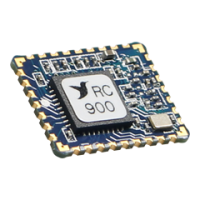 Wireless UART RF modules have a standard UART interface and have a built-in protocol. The designer can usually tweak some aspects of the protocol, but the basic structure is defined inside the module. The main advantage of these modules is that the protocol is done. Simply write the data to be transmitted to the serial port and the module handles the transmission and reception automatically. This significantly reduces the processor code development. However; the protocol is common to all users, so some potential for different systems to cross-talk exists. This can be dealt with by the application inside the data payload. The RF Remote Control module is primarily designed for remote control applications. Taking a line high on one side causes a line to go high on a paired system which can then be used to activate external circuitry. Some of the Remote Control RF Modules have the remote control functionality built in while others are transparent modules that get paired with remote control encoders, decoders or transcoders. Linx Technologies strives to make every engineer a hero in record time™ by minimizing the risk, delays, and technical challenges for design engineers to make their products wireless and connected. If you choose to incorporate our Remote Control RF Modules in your design, we relentlessly focus on ensuring your successful product launch. 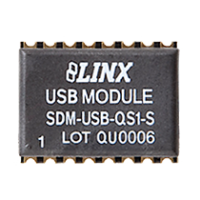 The Linx QS Series USB Interface module allows the rapid addition of USB to virtually any device. Housed in a compact SMD package, the QS module provides a complete solution for converting between USB and CMOS / TTL logic level serial sources. 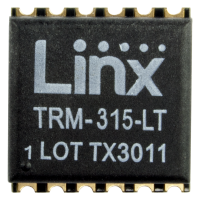 The module can be directly connected to virtually any serial device including microprocessors, RS-232 / RS-485 level converters or Linx wireless RF modules. The QS module is completely self contained so it requires Figure 1: Package Dimensions no external components except a USB jack and includes all necessary firmware and drivers, freeing the designer from complicated programming. Power can be supplied externally or from the USB bus. Both USB 1.1 and USB 2.0 are supported at data rates up to 3Mbps. This is an archive of RF modules that have been discontinued. This is provided as a reference for our customers. 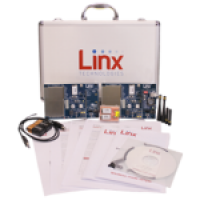 RF module evaluation kits and master development systems help you develop hardware and software using Linx modules. Each kit comes with two evaluation or development boards for benchmarking and prototyping, each of which is populated with one or more modules. A prototyping area gives you a place to develop circuitry. To help you get started, each kit also includes antennas and extra modules. Compared to an evaluation board, a master development systems board has a larger prototyping area and an interface for connecting to a PC. As our tag line is Wireless Made Simple™, we specialize in making the complex world of radio frequency easy to use for engineers of all skill levels.